In light of the many administrative and institutional changes Cathedral Prep has undergone, there was an opening for a new position, the Assistant Vice President of Academics and Student Affairs. Mr. Richard “Rick” Herbstritt, a graduate of Prep’s class of 1996, accepted the position, returning to his alma mater. Mr. Herbstritt first decided he would attend Cathedral Prep for high school because of the effect on his family, as well as the strong traditions and brotherhood commonly associated with the school. “When deciding which high school I wanted to attend, I saw that my father and uncle were successful in life and that Cathedral Prep allowed them to achieve their success,” Mr. Herbstritt said. This success was so promising, Mr. Herbstritt helped pay for his tuition himself. As a student, Mr. Herbstritt described how he was a regular student at Prep. He made sure he was focusing his strong work ethic towards his academics while also staying in line. Mr. Herbstritt enjoyed his electives, theology, and math classes the most out of his classes. In addition, Mr. Herbstritt was active outside of the classroom when he attended Prep. He was active in Key Club and the Teenage Action Club. Mr. Herbstritt also was the bookkeeper for both the CYO basketball team his father coached and the Prep varsity basketball team. However, he also recognized the importance of having fun with his friends during his time in high school. Mr. Herbstritt always enjoyed participating in the various intramural sports competitions being held. Throughout high school, Mr. Herbstritt built robust and meaningful relationships with his newfound “brothers,” many of whom, he is still in contact with to this day. In fact, some of them are even godparents to his children. One story Mr. Herbstritt said he would never forget was about his first rally as a freshman. When the senior rally crew came into the auditorium to abduct a small freshman, the seniors carried the freshman back onto the stage, hoisting him on top of their shoulders for him to yell out the infamous “Give me a P-R-E-P” chant. The freshman began the cheer as normal, but then messed up the spelling of “Prep,” accidentally spelling it “P-E-R-P.” Mr. Herbstritt and his friends still talk about it to this day. It’s a favorite subject of discussion at class reunions. After graduation from Cathedral Prep in 1996, Mr. Herbstritt attended Penn State Behrend, Gannon, and Edinboro University while also working at the Barber Center both full- and part-time. Mr. Herbstritt received his teaching certificate from Gannon, and then received his master’s of education from Edinboro University. Before taking the Assistant Vice President position at Cathedral Prep, Mr. Herbstritt was living in Erie, but he was working in Clarion. In Clarion, he enjoyed his work and time there. Eventually, he heard there would potentially be downsizing, where some employees would have to be laid off. He, among other staff members were now on the bubble, and someone would have to be let go. Remarkably, shortly after this new situation Mr. Herbstritt was asked by Mr. Pituch for an interview at a new position at Prep. He decided he would meet with Father Jabo for the job interview. Shortly after, Mr. Herbstritt was the new Assistant Vice President of Academic and Student Affairs. Mr. Herbstritt was happy with how the situation turned out. Firstly, he was able to return to work at his alma mater and the commute was easier. But more importantly, he saved someone else’s job in doing so. This person he helped was also unfortunate to have lost a family member during this time. He felt really good about being able to help this person in need because it was self fulfilling and felt good, a life lesson he learned at Prep. 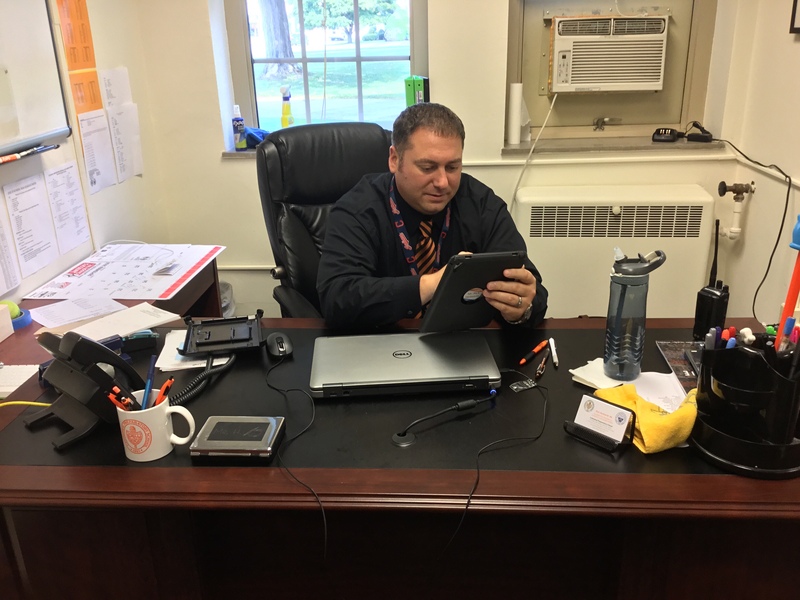 With Mr. Herbstritt reuniting with Cathedral Prep by being there full-time after 22 years, the major differences he notices are the renovations made inside the walls to the lockers, classrooms, overall appearance, and the integration of technology. Over this 22-year period, the traditions of Cathedral Prep did not seem to change for him, which is one of his goals as an administrator. Mr. Herbstritt is a Man of Prep who truly believes in having Rambler pride in your school, brothers, and faith. One thing Mr. Herbstritt would like students to understand is the strength and unity of the Prep community. Not only is it a great family to be apart of during the four years a student may be here, but also you do not leave the community when you leave the Warner Theater’s doors after graduation. One lasting piece of advice Mr. Herbstritt would like to share now that he has been a student and administrator of Cathedral Prep is that life is challenging. In life, you are going to need to fall back upon your fundamentals, because it is something we should always be able to rely upon. In doing just this, you can limit the amount of wrong choices you make. In addition, becoming a true man involves how you learn from your mistakes. Cathedral Prep provided Mr. Herbstritt with a foundation for his life he can always fall back upon, which include his insights, new knowledge, and an enduring brotherhood.